Construction is underway on the Waverley Underpass Project. The project includes replacement of the existing at-grade railway crossing at Waverley and Taylor with an underpass, along with reconstruction and rehabilitation of Waverley Street. Taylor Avenue, between Waverley Street and Lindsay Street, will also be expanded to four lanes. This project will not only improve traffic flow but will also enhance safety, mobility and capacity as well as active transportation within the project area. See the project table below for ongoing updates including the results of the 2015 preliminary design study. Following on the success of construction in 2017 and 2018, we are looking forward to our final year of major construction for this project. The project is on schedule to be complete in Fall 2019. Over the winter months, excavation of the underpass was completed, and work on land drainage components has advanced. With the spring thaw now underway, underpass roadworks will begin in the coming weeks and continue throughout the 2019 summer construction season. Traffic is expected to continue to operate on the detour road until August 2019, at which time it will be transitioned under the underpass during a weekend closure. Construction will continue into October 2019 to complete all roadwork. Additional updates will be issued as these milestones approach. Please see Construction Update #8 for additional details. A successful 2018 is coming to a close! Underpass bridge construction was completed in late August 2018, and trains are now operating over the new bridge. The rail detour is now being removed. Intersection improvements at Wilkes Avenue and Waverley Street, the twinning of Hurst Way, and new eastbound Taylor Avenue lanes have also been completed. Work over the winter will include removal of the rail detour, bulk excavation of the underpass along Waverley, and continued construction of the pump station and associated land drainage works. Traffic will continue to operate on the detour road over the winter of 2018-19. Please see Construction Update #7 for additional details. Construction on the Waverley Underpass project continues as the end of the 2018 summer construction season nears. The rail carrying bridge structure is now complete, and throughout the fall of 2018, rail crews will be working to transition trains off the detour onto the new bridge. Once complete, excavation of the future underpass roadway (which has started on the north side of the new bridge) can be completed over the winter. Take a minute to view a video showing an overhead flythrough of the project site taken this summer. Northbound and southbound Waverley Street will be completely closed between Wilkes Avenue/Hurst Way and Taylor Avenue. Eastbound Taylor Avenue will be closed between Ash Street and Cambridge Street. The Reh-Fit Centre parking lot will remain accessible. Please note that the westbound lane on Taylor Avenue will remain open throughout the weekend. Once the weekend work is completed traffic will resume using the detour road. This is the second of three weekend closures planned as part of the Waverley Underpass project. All travelers through the area should allow additional time to get to their destination, and use alternate routes such as Route 90 or Pembina Highway. For Transit re-route and schedule information, visit winnipegtransit.com. Spring is here and work on the Waverley Underpass project continues. Work on the bridge and pump station occurred over this past winter, and will continue into the fall of 2018. A busy summer of road work is ahead of us, with roadwork planned on Taylor, Hurst and at the intersections of Waverley at Wilkes and at Taylor. Traffic will continue to operate on the detour road throughout the summer. Please note that temporary lane and sidewalk closures will continue to occur during construction. For more information, see "Construction Update #5" under the Documents tab. The Waverley Underpass project is moving along smoothly, and remains within budget and on schedule. Works completed to date include the road and rail detours, and the renewal of Waverley north of Mathers up to and including the Grant intersection. With traffic operating on the temporary detour road and trains on the rail detour, construction of the rail bridge can now occur. During winter 2017/2018 several areas within the project will be under construction including the rail bridge, pump station and underground works on Taylor Avenue. Traffic will operate on the detour road throughout this phase. Please note that temporary lane and sidewalk closures will continue to occur during construction of the Waverley Underpass project. For more information, please see Construction Update #4. Motorists, cyclists and pedestrians traveling in the vicinity of the Waverley Underpass project from Wednesday, November 1 until Friday, November 3 can expect additional travel delays as the rail detour is implemented at the at-grade railway crossing on Waverley Street just south of Taylor Avenue to facilitate further construction of the underpass. Construction of the rail detour, called a "shoofly," is almost complete and from about Wednesday, November 1 to Friday, November 3, trains will be transitioning from the CN mainline over to the shoofly. This work will involve passage of specialized equipment and workers through the crossing. During this time, additional delays over and above the usual delays caused by daily train traffic at this location can be expected. Drivers, cyclists and pedestrians are reminded to refrain from queuing or stopping on the tracks, and to always come to a stop in advance of flashing bells and gates when trains are approaching. Motorists are encouraged to plan their travel routes, use the Waze app for real-time traffic and incident updates, and to allow additional time to get to their destinations while the rail detour is implemented. View this closure on a map. View the detour road on a map or view a video of the new detour. The City has launched a travel time information system to help drivers anticipate and avoid delays caused by train crossings and construction while the Waverley Underpass Project is underway. Travel time information will be relayed to drivers in real-time on an electronic message board on northbound Waverley Street in advance of McGillivray so motorists can consider alternate routes. Construction of the Waverley Underpass is in full swing and as construction progresses, there will be phases of work that require lane closures and traffic restrictions in order to complete the work. In addition, delays caused by train traffic will continue to occur until the underpass opens to traffic. A network of sensors will be used to detect the presence of trains and vehicular traffic, and predict travel times for northbound Waverley traffic from McGillivray Boulevard to Taylor Avenue. Detection of inbound train traffic will allow predictive algorithms to forecast rail-induced delays on Waverley Street before they occur. This travel time information will be relayed to drivers in real-time on an electronic message board installed northbound Waverley in advance of McGillivray. The system will remain in place for the duration of the Waverley Underpass Project. Preliminary underground works including installation of construction fencing and land drainage pipes on Waverley are substantially complete. Between the Spring and Fall of 2017 several portions of the project will be under construction. These include: road and rail detours, intersection improvements at Grant & Waverley and Wilkes & Waverley and the rehabilitation of Waverley between Mathers and Grant. For more information, please see Construction Update #2. Construction is underway on preliminary works required to be in place prior to starting construction on the detour road and rail, which include construction fencing and installation of land drainage pipes adjacent to Waverley and an outfall to the pond west of Grant Memorial Church. Between the Spring and Fall of 2017, several portions of the project will be under construction. These include road and rail detours, Grant and Waverley intersection improvements and rehabilitation of Waverley between Mathers and Grant. For more detailed information, please see Construction Update #1. The online survey is now closed. A public engagement summary will be posted online before the end of 2016. Detailed design work for this project is nearing completion. Preliminary underground construction will begin in early 2017, with more visible road and rail construction anticipated for spring of 2017. Project updates will be available on this website as construction progresses. Two detailed design open house sessions were held on October 6, 2016. Approximately 500 Winnipeg residents attended the open house sessions. We received 48 exit surveys at the open house and an additional 86 online so far. Survey responses will be accepted until October 31, 2016. The detailed design process for the project is currently underway. An Open House Event will be held on Thursday, October 6, 2016. The open house boards can be viewed in advance of the event. 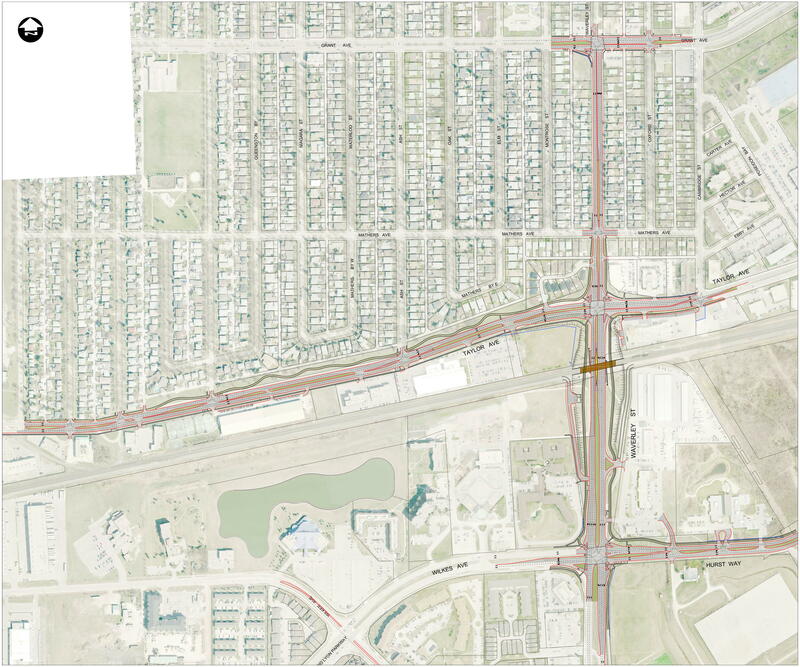 In early 2014, the City of Winnipeg initiated a preliminary design study for the Waverley Underpass Project. The project team was tasked with developing a high level design for a grade separation of Waverley Street and the CNR Rivers rail line. The design also includes intersection and road improvements within close proximity of the project area, primarily along Waverley Street. Based on traffic modeling, the transportation study, public engagement, and the existing constraints, the design team developed a draft concept for the underpass structure, roadway upgrades, and intersection improvements: Draft Concept Map. This concept has been further refined through the detailed design process: Detailed Design Maps for Waverley and Taylor. The primary objective of the project is to provide a grade separated crossing of Waverley Street at the CNR Rivers Rail Line, and improve the transportation network in the vicinity of the project area. Two open house sessions were held on October 6, 2016. Online surveys were accepted until October 31, 2016. We received feedback through 107 online surveys and 49 exit surveys. Feedback is currently being considered and a summary of the engagement process will be posted online before the end of 2016. Sign up for the City of Winnipeg public engagement newsletter to stay updated on engagement activities you may be interested in. Construction started in January 2017 beginning with utility relocations. Road and rail detours will be constructed over the summer and fall of 2017. Construction will be complete by December 2019 with some minor work such as landscaping continuing into 2020. Both Waverley Street and Taylor Avenue will remain open to traffic during construction via a detour. In order to have the detour operate at maximum capacity, there will be selected turning restrictions in place while the detour is in operation. For example, eastbound traffic on Taylor Avenue will be required to turn southbound on Waverley Street. Please see the detour map for more information. Motorists are encouraged to find alternate routes. Total project budget is approximately $155 million. This is a class 3 estimate (accurate within +30% to -20% of the final construction cost). The project will be funded by the City of Winnipeg, the Province of Manitoba and the Government of Canada. CN will also be contributing financially to the City’s share of the project. Relocating rail lines is a long term concept that would require consensus from a multitude of stakeholders. The City needs to move forward now to accommodate the rapid growth in the southwest quadrant of the City and to alleviate the increasing traffic congestion in this area due to heavy train operations. Building the underpass will not prevent discussions in regards to rail relocation. The vast majority of the project can be built on City owned land and right-of-way. However, temporary construction easements and small parcels of land are needed for the construction of this project. In order to ensure we meet the project timelines, property has been expropriated. We continue to work with affected land owners to address specific issues related to their property. An overpass was considered early on in the design process. However, due to heights, clearance requirements, property impacts, and other engineering constraints, this option was deemed not feasible. No, this option was examined by the City of Winnipeg, and is no longer being considered. The Waverley location continues to be the preferred rail crossing location, and has been identified as a potential crossing location since at least the early 1970s. The right-of way and property required for the Waverley Underpass is largely assembled, and would have minimal property impacts. In addition, there is an existing agreement in place with CN Rail for a grade separated rail crossing at Waverley, which obligates the railway to pay for a portion of the crossing. Will the four-way stop at the intersection of Taylor Avenue and Borebank Street remain in effect after construction? Yes, the existing four-way stop at the intersection of Taylor Avenue and Borebank Street will remain in effect once the twinning of Taylor Avenue between Lindsay Street and Waverley Street is complete. Will Lindsay Street be widened or modified as part of this project? No, there are no plans to do any work on Lindsay Street as part of the Waverley Underpass project. I live south of the CN rail line, and noticed that when travelling northbound on Waverley Street I will not be able to turn left (westbound) to Taylor Avenue while the detour is in operation. How will I access businesses on the south side of Taylor Avenue (west of Waverley Street) during construction? Motorists coming from the south side of the CN rail line and wishing to visit businesses along Taylor Avenue between Kenaston Boulevard and Waverley Street are encouraged to travel northbound on Kenaston Boulevard, go under the Kenaston Underpass, and then proceed eastbound on Taylor Avenue to reach their destination.